As the semester nears its closure, it is becoming more apparent that students will  do just about anything to get ahead of their peers. Finals are but a few hours away for some of us, and we can barely trust our friends that were once study buddies for fear they might screw up the curve. Fear not, because there’s a new way to make sure you’re in prime position to tear through your finals without succumbing to the Adderall and Red Bull craze that pervades this time of year. For the mere price of an Andrew Jackson, you can lounge in that stiff wooden chair that is guaranteed to be more comfortable than your dorm chair, your bed, and the roof of Pimentel Hall. 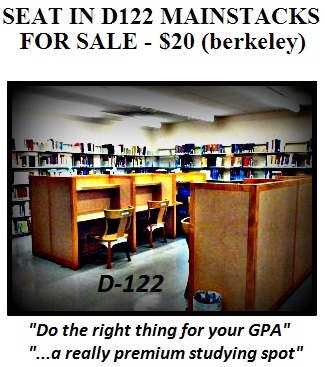 It seems that UC Berkeley students have innovatively come up with ways to make financial progress through these tough times along with their academic advancements. This unnamed entrepreneur is offering you the once-in-a-lifetime chance to snag a seat in one of the best locations on all of campus. The Gardner Main Stacks are a perfect spot to study, though they have allowed the air of intellectual stimulation to get contaminated by the leftover stench of the naked run, or the general possibility of the existence of Stanford students in the library. We have learned that this individual arrived early yesterday morning to claim the spot — a testament to his or her phenomenal bladder control capabilities, and the financial suaveness that is characteristic of all Haas students. The seller on Craiglist — who posted the ad Saturday afternoon — is claiming that it is a premium spot, and we couldn’t agree more. Among the 400 seats in the Main Stacks, seat D122 is the absolute best. It’s ideally located with respect to both the heat source during seasonal winter – as it technically is right now – and the cross breeze in the summer, which is what it feels like. It faces the wall at a direct angle, which could allow you to immerse yourself in your study tool of choice or allow your eyes to peruse the intricate patterns on the ceiling – both of which can be done without being subjected to the slightest possibility of conversation. Be sure to hurry in and claim this single point of consistency in an ever-changing world – because right now, it’s the seller’s chair, and the seller’s rules.